What does CW stand for in ham radio? CW stands for "continuous wave" transmissions, and it dates back to the earliest days of amateur radio. Thinking of the old telegraph offices, communication was accomplished with a "straight key" and the operator, using "Morse Code" simply used the key to interrupt a continuous transmission into "dits" and "dahs". Learning Morse Code is not that hard. Now simply called "CW", radio communication by Morse code was the only way to communicate for the first decade or more of Amateur Radio. Radiotelegraphy, the proper name, descends from landline (wired) telegraphy of the 19th century, and retains some of the old culture, including a rich set of abbreviations and procedures. Morse sent by spark gap transmitter was the first wireless communication mode. These "damped waves" were very broad and inefficient for communication. They were soon replaced by "Continuous Wave" (CW) transmission, using vacuum tube oscillators that were capable of a very pure note. Today, modern Amateur Radio transceivers use solid state components and microprocessors to support a variety of communication modes including CW, voice, image and many digital data modes. This motivated efforts to produce radio frequency oscillations that decayed more slowly; had less damping. There is an inverse relation between the rate of decay (the time constant) of a damped wave and its bandwidth; the longer the damped waves take to decay toward zero, the narrower the frequency band the radio signal occupies, so the less it interferes with other transmissions. As more transmitters began crowding the radio spectrum, reducing the frequency spacing between transmissions, government regulations began to limit the maximum damping or "decrement" a radio transmitter could have. Manufacturers produced spark transmitters which generated long "ringing" waves with minimal damping. It was realized that the ideal radio wave for radio-telegraphic communication would be a sine wave with zero damping, a continuous wave. An unbroken continuous sine wave theoretically has no bandwidth; all its energy is concentrated at a single frequency, so it doesn't interfere with transmissions on other frequencies. Continuous waves could not be produced with an electric spark, but were achieved with the vacuum tube electronic oscillator, invented around 1913 by Edwin Armstrong and Alexander Meissner. In order to transmit information, the continuous wave must be turned off and on with a telegraph key to produce the different length pulses, "dots" and "dashes", that spell out text messages in Morse code, so a "continuous wave" radiotelegraphy signal consists of pulses of sine waves with a constant amplitude interspersed with gaps of no signal. Damped wave spark transmitters were replaced by continuous wave vacuum tube transmitters around 1920, and damped wave transmissions were finally outlawed in 1934. 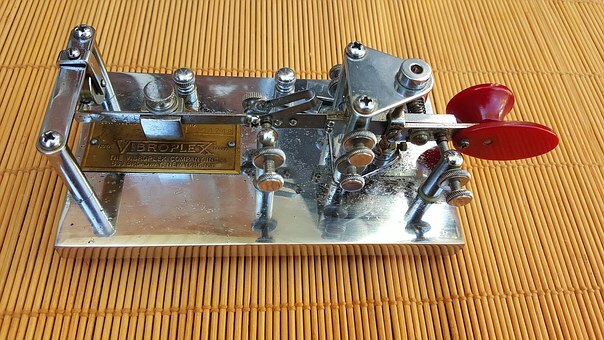 There are several different type of Morse keyers. 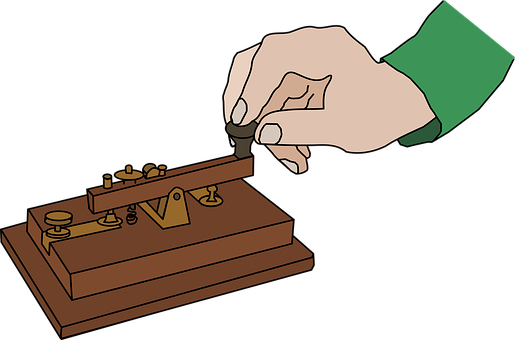 Straight keys, mechanical bug keys, el-bugs, paddles, single paddles, iambic paddles are all names for various forms of Morse keys. More information of types of keyers is on this following link. Today Morse code is primarily used among amateur radio users. In fact, up until 2004, if you wanted to get your amateur radio license in Canada, you had to pass a Morse code proficiency test. Now there are two ways to achieve these greater operating privileges: by passing the Basic exam and also by demonstrating the ability to send and receive Morse Code at 5 words per minute or by scoring a higher mark on the Basic exam. The “Basic with Honours” qualification is awarded to persons who get 80% or higher on the 100-question, multiple choice exam. Today the majority of candidates who pass the Basic exam achieve Honours and are able to use all Amateur Radio bands immediately. Learning Morse code is like learning any language. You have to practice, practice, practice. Get familiar with the code. The first thing you’ll need to do is get familiar with what the alphabet looks like in Morse code. Below is the International Morse code alphabet. Here is one of many video's out there that can help any amateur succeed in operating Morse Code. There are also many Morse code app's on your phone. One I find is good is Morse Mentor. 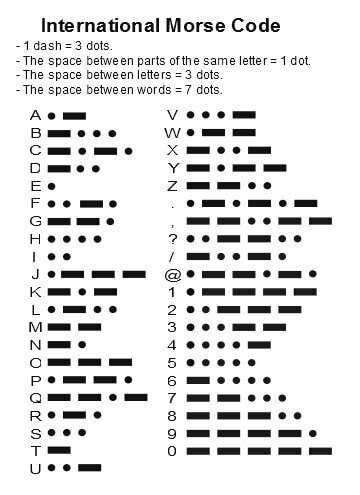 Go to this page to learn morse code in one minute. After learning the characters of Morse Code , you may want to learn about spacing and rhythm. The video below will explain that you must listen and not count each dit and dah, and of course, Practice, Practice.